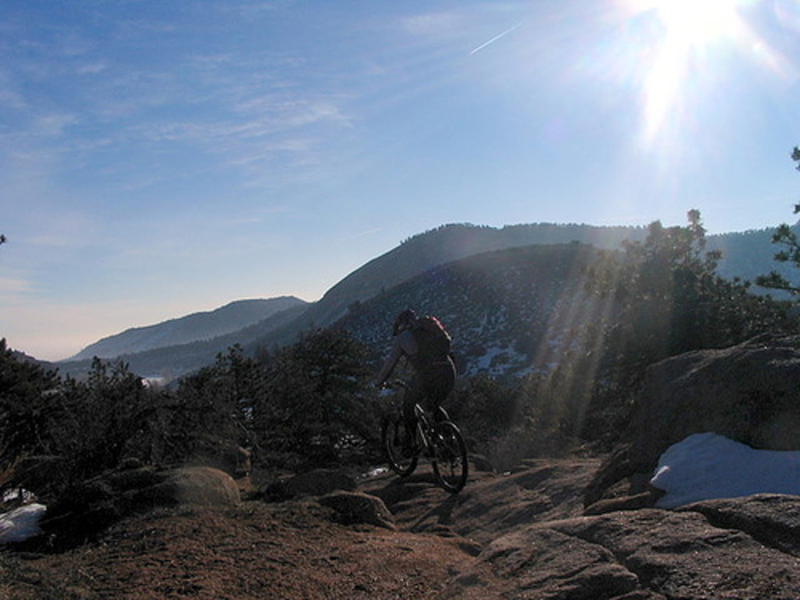 Hall Ranch has 3 singletrack trails that offer riders 11.5 miles of expert and intermediate mountain biking. Depends on what trail(s) you jump on. Hall Ranch in Lyons is best known for its technical rock garden along the Bitterbrush trail. This one mile climb will challenge cyclists with a series of challenging obstacles with only the briefest reprieves between difficulties. However, they are not so hard that they can’t be linked together and a no-dismount climb through the entire thing is something to brag about. Oh yes, you will have to descend through the rock garden as well. Experienced riders will absolutely love the darline lines and precise turns, while newbies… well, let’s just say it’s not unusual to give leave blood or the occasional tooth on the trail. Those in the middle, i.e. bold enough to try some of the sections but smart enough to know when to bail, will find Hall Ranch a great place to monitor their progress as a mountain biker. Note that all the technical sections can be easily walked around. Hall has the best of all worlds: stiff technical sections, switchbacks, speedy singletrack, robust climbs and even the occasional jump. The views of Longs Peak at the western edge of the trail are incredible. But it is the rock garden that is Hall’s hallmark piece -- you may want to bring pads if you want to clear this mighty test. But there is more to Hall Ranch than the rock garden! At the top of the rock garden climb, the trail eases up to intermediate terrain with great views -- and some subversively tough climbs. 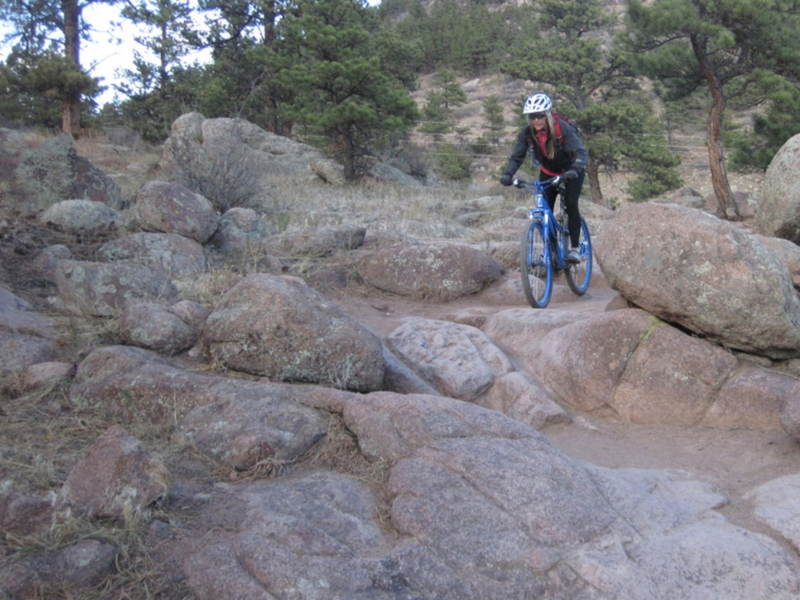 The main trail spins out two miles to a lollipop loop that explores the old Hall Ranch homestead and offers a blazing singletrack experience either way you go. Additionally, the Antelope Trail avoids the rock garden and comes into the main trail via a loose, intermediate trail. Parking for the Antelope Trail is about 5 minutes from the standard trailhead and is good for riders who want to avoid the more harrowing parts of Hall Ranch. All told, an out and back is about 12 miles though you can tack on laps on the loop or link the Antelope trail from the standard parking. And if you want to go epic, it’s a 1 mile ride on the road to connect over to Heil Ranch, another trail network that offers over 15 miles of singletrack fun. Technical riders who are ready to test their mettle and go fast! Intermediate riders will also have a blast trying the obstacles and dashing through the trails after the garden. 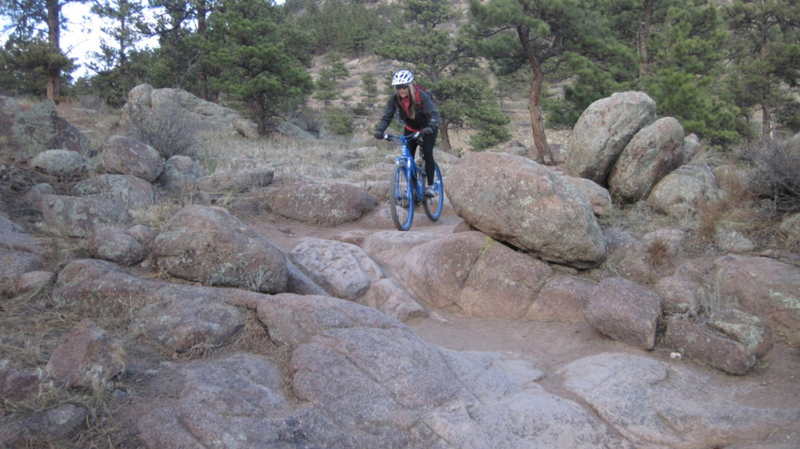 Beginners can also have a good time, especially if they access Hall via the Antelope Trail. For the alternate Antelope trailhead, follow the same directions from Boulder, but at the light at the intersection of 36 and 7 go right (towards Estes Park). This is still 36; follow it about a half mile to Apple Valley Road on your left. Follow Apple Valley Road 0.75 miles to a fork. Stay left (which is really more like straight) onto Antelope Road. The trailhead will be at the end of this road. Note it only has parking spaces for about 6 cars.